Guinness has created a way to get people talking about their beer by drinking their beer? They have implemented QR codes on pint glasses. What makes this code special to Guinness is the trick behind the code. The code only works if you are drinking a dark beer, such as Guinness. If the glass is not full or full of a lighter beer, the code will not work. QR codes are a matrix barcode that is scanned with a smart phone. Once the code is scanned, the glass tweets about your pint, updates your Facebook status, or even checks you into Foursquare. 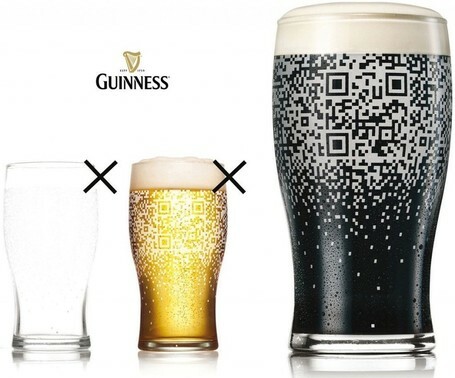 What is interesting about this is that QR codes are usually found in magazines, on buses, on signs, on business cards, etc, but they are not usually found on pint glasses. 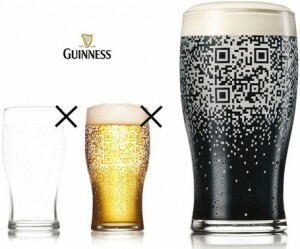 What Guinness has successfully done is connecting a casual social activity with social media. And in this situation, the social media generated helps promote them. Guinness has taken beer marketing to a whole new level. This modification made to their packaging has created a wave for their social media. New QR codes on more products could be a new trend in social media. Millions of users already tweet and check into where they are located and what they are doing every single day. Guinness has made “checking in” and updating your social media pages as simple as a click of a button. Genius. Social media has encompassed our world and lifestyles. Not only is social media used for personal reasons, but now businesses have put their mark on social media. Marketing via social media is a great way for businesses to get connected with a vast amount of people at the same time. It creates communication among consumers and has the potential to attract new ones. One of the main benefits of using social media is that it is free and easy to use. All you basically have to do is create a profile and let the marketing begin! Keep in mind that content is key to having a successful social media campaign. If your content is not interesting or useful, you will have no luck with social media. Social media allows you to share, network, publish, and discuss. Although social media has these benefits for businesses, it is hard to decide which ones to use. There are so many social media outlets to choose from that it can get confusing. Let’s take a look at the most popular social media networks and what benefits they provide. LinkedIn: LinkedIn sets the stage for networking with business professionals. It allows you to personally brand your business and market yourself to others within your industry. It is also a great outlet for providing knowledgeable content that informs and educates users. Lead generation is the most valuable outcome of using LinkedIn. Facebook: Facebook has more than half a billion users, making it a great way to share a message and reach a large amount of people simultaneously. It opens up a communication portal and creates social interaction. Facebook works great as a promotional tool. You can promote your products, services, and events to a mass audience, giving your business the opportunity to expand. Frequent and interesting posts will help to keep users attracted to your business. Twitter: Twitter is your outbound messaging tool. It consists of tweeting 140 characters or less messages to users. These tweets are short and concise, creating a social buzz. This buzz creates interaction with users. While you are tweeting it exposes your business and brand, and then you get to hear who is talking about you and what they are saying. Twitter is all about listening to others through feedback. YouTube: Known as the largest video sharing community, YouTube is also a marketing and advertising tool. It gets an informative and positive message right in front of existing and/or potential customers. Creating and sharing a video on YouTube provides the opportunity to share knowledge, market products, show off expertise, and connect with users. Videos that are compelling and entertaining will catch the attention of users, also creating interaction for your business. Millions upon millions of people have created their own presence via social media. It isn’t just a place for individuals to keep in touch with family and friends, it has also grown into an extraordinary marketing tool that businesses should take advantage of. Facebook and Twitter for example have upwards of 600 million and 400 million users respectively, providing businesses and marketers with a vast platform of people to market to. Marketing is an action businesses need to take to attract consumers to their products or services. 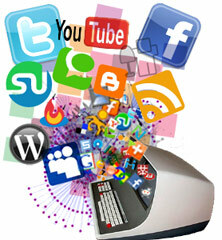 Social media marketing is just a new form of marketing in the new digital age we are living in. Social media marketing has many benefits for businesses. Here are 4 ways social media marketing can help businesses and marketers. 1. Increase exposure: If social media is just used at its simplest form by just minimally creating a presence and updating it on occasion, you are still creating exposure to your business. Social media marketing allows for your name to be seen. Since millions of people participate in social media, the more you use social media increases your chances for exposure. 2. Increased traffic: Social media marketing allows for traffic to be increased. One benefit of social media is that you can provide links to your website or anything else related to your business. By providing links and information for people, there is a higher probability of creating traffic as your exposure becomes more proficient. 3. Lead Generation: If you think just teens and college students are using social media you are wrong. Businesses all over the world are using social media for marketing. This provides businesses with another way to generate leads and interact with them. 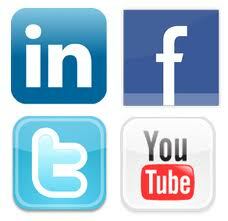 Social media networks also provide a wider reach and database of people who could be leads. 4. Advertising: One of the main benefits of social media is that most sites are free. This gives companies the ability to have their name present without spending a dime. The best part of using social media for advertising is that users that know and like you are automatically endorsing you. Marketing via social media is a great way for businesses to get noticed. It is easy to get started as well as easy to maintain. Social media is changing the way we market businesses, products, and services. I’m sure you have heard of Baby Boomers, Generation X, and Generation Y. But have you heard of Generation Z yet? These are people born between 1992 and 2010. They have witnessed 9/11, an economic recession, wars in Iraq, a growing environmentally friendly conscience, the first African American President, and a world that changes everyday. Some categorized in this generation are just learning how to walk and talk but yet they changing the way products are bought, services are used, and how communication works. 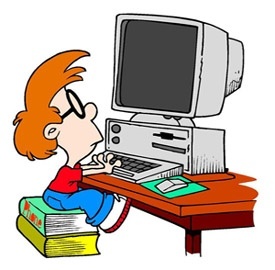 This generation is very interesting because they have never known a life without personal computers, mobile phones, MP3 players, and the Internet. These are the true people within the digital age that are very comfortable with technology and are used to it changing. The way this generation communicates is intriguing. Their main way of communicating is through mobile devices and social networking sites like Facebook and Twitter. Marketing efforts via social media will be important in attracting this generation to become potential consumers of products and services. One thing marketers need to understand is that Generation Z’ers are not your typical consumers. They do not take well to branding initiatives, considering how everything around them changes so fast. They expect constant feedback and instant results, meaning marketers need to keep pace with these individuals. Creativity needs to be used to reach this generation. Marketers also need to be aware that one form of marketing to this generation will not be enough. They are notorious for being multi-taskers, which means they are checking multiple social network sites at once, or shopping online at more than one store. To reach these people, multiple outlets need to be used. Generation Z will be a fun generation to market too. They already have a knack for technology, which will allow marketers to use creativity to attract this generation as potential consumers. If you don’t know the name, you know the face. He is the currently an internet viral sensation who is also the poster boy for Old Spice. Old Spice’s genius marketing campaign has become a YouTube hit. The original commercial, “The Man Your Man Could Smell Like” currently has 19,625,583 views! After the original’s success, Mustafa and Old Spice created Youtube shorts that answered his fans questions, these fans included celebrities like Ellen Degeneres and Alyssa Milano. Old Spice is getting attention from more then Youtube. The company has seen an increase in their social networking interactions. Old Spice Twitter followers were up 3200%, Facebook interactions had jumped 800-1,000%, Google searches were up 2,200% and traffic to the Old Spice website had risen 350-500%. And that’s not the end of this success story either. According to Dean McBeth, a digital strategist for ad agency Wieden + Kennedy, sales of Old Spice body wash have risen 55% and some SKUs are up as much as 1,900%. So what’s the secret behind this marketing campaign? Old Spice changed their image to appeal to a wider age bracket by redesigning their products and rethinking their marketing strategy. Their new commercials and campaigns are witty, funny, and memorable. The commercials also target men and women. Not only that, but by having Mustafa answer fan questions, Old Spice was able to make the brand personal to the public. It looks like Old Spice is back in a big way.